Do you have a budding photographer in your household? Are your kids fascinated by all things picture-taking and begging for their own gear? If you’re wondering what to buy for them, read on as we discuss the 10 best cameras we recommend for kids – and why. You’re probably asking yourself if they are ready for their own camera. Consider this an opportunity to encourage them in a creative endeavor, viewing the world through their own unique perspective. This might turn into more than a hobby someday. Or it might fizzle out. Only you can gauge if your child is mature enough to handle the responsibility of what could be an expensive toy. That’s why we talk about things to consider when you’re ready to invest in a camera for your emerging shutterbug. I received my first camera when I was seven years old. It was a Kodak Instamatic with drop-in cartridges holding 35mm film, back in the day when film was the only option. While this wasn’t necessarily a cheap hobby for my parents to encourage me in, cameras were a passion shared by everyone in my family. Maturity is one important factor to consider when you review your kid’s desire to have a camera. Can they keep it safe, as in not drop it or lose it? Is this a passing fad or something they’re truly interested in? If the answers point you toward making that purchase, consider your budget next. Your choices for cameras these days range from disposable film cameras to entry level digital single lens reflex (DSLR) models. These questions will help you consider what’s going to be best for your child. Is my child responsible with their pets and toys? A pet is a living thing, whereas a camera is inanimate. Does your child shirk the responsibility of walking the dog they begged for, feeding it, or cleaning up after it? Then they might cry for a camera but then rarely pick it up. If you consider the camera a major investment, you’ll want to determine how much it will be used before it ends up on a closet floor or under the bed gathering dust bunnies. If this seems like a passing whim, err on the disposable end of our list. While processing and prints might seem expensive, it’s still cheaper than buying a midrange point-and-shoot that never gets used. 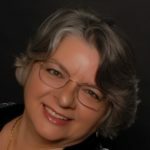 Or buy a less pricey point-and-shoot so the instant gratification of seeing the shot fuels their continuing engagement. Is instant gratification important for your child? Instant gratification is not necessarily a bad thing. While it might produce a temper tantrum in a grocery store, when it comes to photography, it can also bring knowledge about what works and a willingness to experiment. Seeing the shot they just took means they can learn from mistakes more quickly. If your child seems more likely to stubbornly keep trying until they get it right, a digital camera could be a better choice. Instant cameras that produce a print immediately also offer immediate satisfaction, but with a film cost involved. Meanwhile, not knowing what photos look like until 35mm film is developed can be a big disappointment waiting to happen. Does your child progress on a learning curve quickly? Some kids are willing to dive into a subject and learn all they can, going online to learn more or wanting a class to show them how. Others are content to learn by going at whatever pace works for them. An entry level camera satisfies one group for a longer period than the other. A good way to approach the learning curve is to ask if your child would like to take a class or find a mentor to show them how it’s done. If their interest is an extension of your own, this could be a great bonding activity. Classes don’t have to be expensive, with many offered at local libraries or through YouTube or online courses. Can you invest in a class to help your child enjoy this hobby? I was lucky in my early photography days because I had a father who had been bitten by the bug decades before and knew what he was doing. He was also an engineer, more than happy (maybe too happy) to explain how the camera and film worked to make the magic happen. Barring that kind of exposure, I might not have stuck with it the way I did. It’s one thing to take some photos that are so-so and be content because it’s more about sharing an event. It’s another thing to understand the how’s and why’s of what you’re doing so you can get better at it. If developing your child’s interest in a positive activity that can offer them joy for the rest of their lives is what you’re after, consider a camera they can grow into. How will your child want to use the photos they take? A young child might only want to shoot pictures because it’s neat and they want to show them to you and the family. Add a few years, and that kid might be ready to make memories they’ll take out someday with fondness. A teenager on social media could be ready to share appropriately. A film camera, disposable or reusable, is fine for making prints that will last for years. Digital, on the other hand, is necessary for social media sharing. The range of options we list will help you find a camera for any need. Will water be in the picture? This might sound like a funny question, but considering that not all cameras are waterproof, you’ll want to think about the best match for conditions when your child is shooting. Those cute fish seen while snorkeling or the tumbles while boarding on the slopes will be much more adorable if taking the pictures didn’t mean the camera is ruined. Luckily, you have plenty of affordable options in this realm these days. Think about the common conditions your child will be in when they’re shooting with the camera. The camera that goes to camp will not be the same one you allow them to use while you supervise their activities. Many waterproof cameras are also rated for shock (drop) resistance and crushability these days, as well. Is this the second camera to match your child’s skills growth? If your child has already proven themselves to be a committed photographer, a more advanced piece of equipment is a great reward for their persistence and determination. Sometimes the leap is up one step, and sometimes a bigger jump is called for. This is where long term thinking is necessary. For my second camera in my youth, I moved from an Instamatic to shooting my dad’s hand-me-down 35mm Leica. This wasn’t even a leap but more like being shot forward from a cannon, but I had proven I was ready to try more advanced shooting techniques and manual focus. Learning to do things that are more complicated can bring its own pleasure and encouragement. Do you want something to spark hobby interest? This is more toy than gear, but worth talking about. If your child is more interested in how a camera works than how to frame and take pictures, the 35mm Lomography Konstructor F kit will keep them occupied. This build-it-yourself project offers great bonding opportunities, since adults seem to love it as much as children. Kids learn about the interior functions of a camera without taking apart something expensive. Add-on kits for flash (via a socket) and alternative lenses extend the enjoyment. While it might not be the best first model of anything for them to attempt on their own, for a child comfortable with assembly, it’s a wonderful novelty, since Lomography photography is intended to be more artistic than realistic. It’s difficult to pick only 10 best cameras for kids because in many of these categories of gear, a long list of possibilities exists. Sometimes the deciding factor may be picking one brand over another (Canon versus Nikon) because of your brand loyalty. If you take nothing else away from this article, pick a point on the range we offer and look for comparable cameras if you think its level of features will work well for you child. While you most often see camera decision articles focus on the gear capabilities, what they can do and what you can add on, selecting a kid’s camera is more about what it won’t do, like break. That’s why we begin our selection criteria with durability, move through growth, and end up on the dollars. Here are the criteria we’re using to select the 10 best cameras for kids. Analog 35mm film camera options, instant print gear and expensive digital choices set the boundaries on realistic camera choices appropriate for children. In between, you have a broad array of possibilities. Know that when you are talking 35mm film, you’re also investing in the processing down the road. On the other end of the spectrum, digital offers the immediacy of being able to share pictures on social media. That’s appealing to many kids (and parents) because we see what they’re up to, even when they aren’t with us. 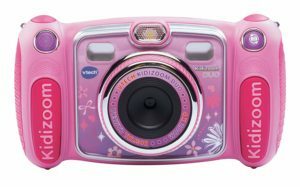 Expect to spend a little more for digital options because of the mechanisms and electronics involved, but often these cameras offer the best opportunities for growing with the child’s capabilities. Cameras as a rule don’t bounce well. Some have been rated as shockproof, though it’s more along the lines of falling from fumble fingers to the ground and not hurled like a football through the air. Durability for a child’s camera goes hand in hand with the responsibility to attempt to keep it safe under normal conditions. In some cases, it’s fine to consider a first camera as a throw-away toy. Like many other children’s versions of adult hobby gear, a fun plastic camera can indicate to you if your child may have a longer term interest in photography. Even when their durability might be considered good, that’s good under normal use circumstances and not under extreme play conditions. The cameras on our list range from one feature (take a picture) to many (manual shooting across many settings). Flexibility means a camera might be appropriate for different shooting situations. If your child’s interest is more than one type of photos, or they want to experiment with different techniques, you’ll want something with the ability to use more settings. Range of settings is also something to consider in this criterion. For example, middle and higher end digital cameras on our list come with auto settings, meaning the user doesn’t need to do anything other than turn it on, frame the shot, and press the shutter release to take a photo. Their other controls require some knowledge about how a camera works to capture a successful image. Most self-contained equipment includes a built-in flash for nighttime or low light shooting. Having this capability expands a child’s opportunities to experiment. Not all cameras come with this, though, so we’ve noted this in our criteria. Note that all flashes are not created equal. Some have a relative short range, meaning they might cast light for ten feet, but no further. If your child understands they won’t be able to light up a stage that’s fifty feet away, they won’t be disappointed when that concert picture doesn’t turn out as they hoped. If you’re a kid shooting a picture of a bird in a tree, it’s fun to be able to zoom in close, closer than you’d ever be able to get in person. While extreme zoom probably isn’t necessary, having a little something extra to get near a subject can intrigue children across all age groups. Learning how to operate it in most cameras is a quick skill to acquire. Some cameras come with a fixed lens that zooms. For other camera bodies, the zoom feature depends on the lens attached. We’ve noted zoom that comes in the camera; if it is in the lens, it is noted as lens dependent. As we noted, cameras and wet stuff don’t always play well together. But kids and wet certainly do, which is why we note if a camera is waterproof/dustproof. 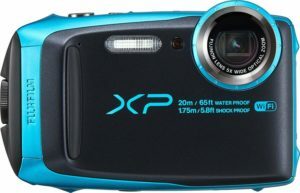 Surprisingly, even digital waterproof cameras are budget-friendly these days. Some cameras are also rated as freeze proof. Those make good options for kids on the slopes. Usually the weak link in the cold is a battery that discharges quickly, so having spares handy is a good idea. Every camera on our list has a fully automatic mode, meaning your child doesn’t need to understand how a camera works or why a feature is important is they don’t want to know. For those who want to learn more, though, being able to change controls and try new things can be the impetus to keep learning more. What might be a more complicated camera than your child needs today can be something they grow into tomorrow. Some of our selections have universal appeal, meaning your child’s first serious camera might be something they hang on to well into their adult years. Back-to-basics models are great for learning about aperture, shutter control and exposure. The more advanced options on our list are even favored by professionals, which adds a nice panache to your gift. If your child seems inclined to make movies or captures things in motion like sports or wildlife, you’ll want this capability in the gear. The highest definition video (4K) might not be necessary, but even standard definition, also called Full HD (1920 x 1080) produces good quality results. The higher the numbers, the greater the resolution of the video and the sharper the images will be. Video is a feature only available on digital cameras. Know that it eats up photo storage space in the camera and can eat up data charges when transferred to a cellphone for sharing. Often, it’s best to use the ability to transfer directly to a computer or tablet for just this reason. While there is no implied ranking in the order of cameras on our list, gear is generally grouped from the simplest to use (and least painful to lose) to more sophisticated, complex (and higher priced) models. This non-scientific study is instead based on what gear experts and reviewers generally feel are the good points and challenges to consider with your options. All cameras are available from multiple retail sources; one is vintage but widely available from third-party sources. Want to give your child of any age something to take to camp or out on the slopes to capture their adventures when you’re not around? Durable and built with enough basic features to shoot in most conditions your kids of all ages find themselves in, this is the 35mm film answer to cheap digital point-and-shoot. Give kids at a party a pile of them and see what develops. The camera comes preloaded with ISO 800 film, good enough for low light situations when combined with the built-in flash. You then take it anywhere that can develop 35mm film (many drugstores still do, camera shops, or online). You will receive prints (hopefully of all possible 27 images) and often a disk with the images; some developers make them available via a website too. There is no screen to see what you’re shooting, which means your child may be disappointed to find what they wanted to take a picture of didn’t make it into the frame. Since it’s one-time-use, it’s not environmentally friendly. Some people say their images came back fogged, as if something was wrong with the film or it is simply poor quality. A significant complaint was the strength of the flash, with reviewers noting that under normally well-lit conditions, interior shots came back without adequate light. Also, the flash needs to be reset for each individual shot, something children might not remember to do. 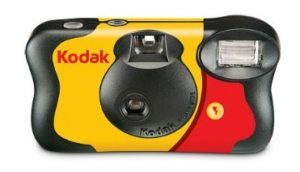 Still, for those situations when you don’t want to make an investment in more permanent gear, the Kodak Disposable will allow your kids to make memories of their special explorations. For a kid’s camera, this packs a lot of play into an attractive package. This beginner’s item is ranked as appropriate for ages three to nine and comes in bright colors (all the better to find out in the lawn when they put it down without thinking). It switches between front and rear cameras, shoots fun selfies, and even has a voice recording feature, all with special effects. The camera has double viewfinders, so your child does not need to know how to squint to use it. Reviewers like the Photo Optimization feature, which automatically takes multiple shots and saves the best one. A Parental Controls Setting limits or disables the five built-in games. This camera runs on four AA batteries which could discharge quickly, even with an automatic shut-off after three minutes without operation. Parents have mixed feelings about durability, ranging from feeling it’s a sturdy toy to a 90-day throw-away. Image quality is rated as okay to poor and video is low resolution, both of which can disappoint children. Some reviewers report that the internal memory fills up quickly, so downloading images and movies via a USB cable to another device is necessary. Expandable microSD memory cards can also be added. Parents report that the camera is not as durable as the manufacturer states, as random shut-offs during attempted operations even with gentle use seems to be a regularly reported issue. 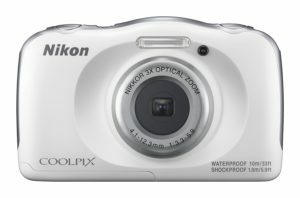 Waterproof, shockproof, and freezeproof, this Nikon COOLPIX is what many parents have been looking for as a rugged digital alternative to disposable 35mm film cameras. It is appropriate for kids from a young age on up, with easy to use operating features scalable in complexity depending on who’s using it. Kids will also like the ability to set special features to create cartoon qualities and other effects in their stills and videos. Reviewers remark that picture quality is clear and consistent across low to high light situations. The lens spans wide angle to telephoto for a range of shooting conditions, and its autofocusing system remains sharp under its many varied environments. It is rated as a good camera for longevity, growing with the child’s interest and skills from a young age through early teen years. Small hands may not be able to reach all controls easily. Some users note that the image transfer features that should work automatically are not always reliable, requiring some finagling that might frustrate kids to teens. The battery life indicator has been reported to be inaccurate. Reviewers said the waterproof feature may be faulty on some models, as there are reports of condensation building up when users are swimming. Another issue arises with the memory card door popping open while under water. Even though the controls are limited, they are made more so because explanations in the manual are sparse. If your middle-to-high school kids are heading off on an adventure where the camera needs to be hardy, consider this Fujifilm. It is waterproof, freeze proof, dust proof and shockproof, and short of deliberately trying to destroy it, should come home in one piece. If offers features not seen in its competitors, like image stabilization to minimize shake and blurring, and an anti-reflective coating on the LCD screen making it easier to use outdoors or underwater. This camera is most often sold as a kit, including memory card, separate memory card reader, case, and software to link it up to your child’s computer for post-production fun. It shoots well across the wide angle to telephoto range. This is an appropriate camera to give to a kid with basic photography skills, ready to develop in complexity as years go by. Some reviewers have been disappointed with image quality in this camera. They note a lower level of detail capture and flaring from bright light sources. However, if your child plans to share these photos on social media or on other mediums where the picture remains small, this might not matter. If you aren’t buying a kit, keep in mind the need to add a memory card or your child will have an inoperable present once it’s opened. While you’re adding things, remember a spare battery, since this camera eats up juice quickly. If your child only wants to shoot in auto-mode, this is probably more camera than needed, given the possibilities in its controls and settings. Is there a budding videographer in your under-18 set? Skip the cameras that are made first for stills and go straight to the GoPro to encourage their adventure movie-making. At Ultra HD 4K resolution, the video potential alone sets this gear apart. It is easy to operate, meaning your kid can go from box to pro in very short seconds, and includes voice control. One feature reviewers love is the Bluetooth connection, allowing the user to live stream what they are shooting to their phone and out into the world. Imagine watching your child’s adventure from the comfort of your living room while they ski down that double-diamond slope you hoped they’d never find. This same feature provides video transfer of media to computer or other device, allowing your child to play with post-production effects as well. 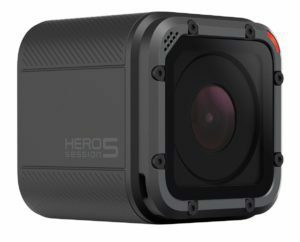 This GoPro does not come with a memory card, meaning you will need to buy a SD Mini (important that you select a Mini) along with the camera. You will also want your cellphone handy to set up the transfer capability right out of the box. Some reviewers report problems with functions if the camera gets too cold, probably because of battery cold-weather discharges. An important item your child may not be careful about is the charging cable. It is a special connection, not a standard interchangeable with other electronics. Since the camera does not have a removable battery, keeping the cable handy is the only way to charge it. If your child loves all things retro, what’s more of a throwback than taking a photo and watching the print develop in front of your eyes? This rechargeable instant camera brings immediacy in its prints to share. It’s easy to use without spending time reading a long list of instructions, making it a great gift for an impatient child who wants to use it out of the box. Images have a unique quality due to the high-end lens and the chemical means the film uses to develop the film. There are no settings to change and no controls to fiddle with. The flash takes the challenge out of low light situations, and it is equally good in bright light based on the film your child selects to load. Since the camera spits out the print right away and it develops through Polaroid’s magic method, there is no image to save via digital means as you would have with digitized negatives of 35mm film or with digitally captured images. Your child can’t easily share the photo on social media or ship it off to the grandparents to enjoy. Copies mean just that – taking it to a copier. Some people find the many varieties of film cartridges confusing. Color is different from special effects, and if your child is artistic and wants to try it all, prepare to spend about a dollar a picture. 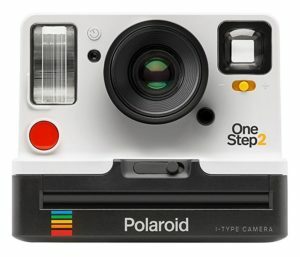 While this model might be good for a younger age group, if your child is older and/or has more sophisticated tastes, explore the range of what Polaroid offers in mini and other versions too. 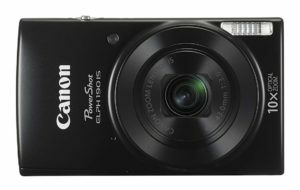 If your child has grown into solid point-and-shoot territory, the Canon PowerShot Elph is a good camera for them to use today and into the future. Dependable, pocket-size, and offering enough controls and features to allow them to follow their muse, this camera steps them up into a higher resolution 20MP optical sensor and quality shooting environment. The 10x zoom also brings the action closer in ways the other cameras on our list cannot. Usually sold in a kit containing everything they need to get started, the Elph introduces children to many digital single lens reflex features they might not have used before. That’s okay, because auto works just fine too. Auto-transfer of image files takes place seamlessly as well. There is no viewfinder on this camera, meaning your child will rely on the LCD to see what they are shooting. This doesn’t always work well in bright light conditions. Unfortunately, the video resolution on this camera is not what people who like to shoot a lot of action would consider enough. The camera without the kit does not include a memory card, so add that on immediately. Some might find the many artistic shooting modes and special effects overwhelming initially. As they’re ready to try new techniques, though, the camera grows along with them. This Canon offers new twists to our list – a high resolution mirrorless sensor, interchangeable Canon lenses, and a tilting LCD touch screen for artistic shooting. Special mode settings help anyone on the learning curve understand how to get better and better in their shooting. This is a camera your middle-to-high school child can keep well into their adult years. The video in this camera is also unique in its fast frame capture of 60p, which means fast moving objects with not end up blurry unless your videographer wants them to. Continuous shooting is another aspect a school newspaper or blog photog might want to explore. 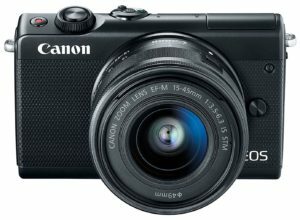 This camera shoots quickly even in low light conditions, and best of all, it’s almost soundless as it does so because it is mirrorless. Interchangeable lenses can become expensive, mainly because your child may always seem to need just one more. However, the possible list of additions is relatively short (which can be good or bad) if pricey. Beware the addition of an adapter ring that expands the lens possibilities exponentially. This camera has limited manual setting capabilities, meaning it grows with your child from beginner to intermediate and maybe past that, but might not satisfy their creative urges. Some reviewers report a child with large hands might find the controls hard to hit, while others call it bulky. Only your child can decide if it’s better than shooting with their cellphone. If your child takes photography seriously and is ready for an entry level camera that bridges the gap from beginner to enthusiast, the Nikon D3400 is a logical next step. Reviewers note the excellent performance of the camera in low light conditions, fast action, and autofocusing. For the first time DSLR shooter, controls are deemed to be well laid out and intuitive for most. This camera encourages your child to expand their skills in shooting, such as framing the shot and applying settings to maximize each image’s potential. Advanced controls help them grow into the camera while feeling comfortable with their abilities in the moment. Integrated back-up of pictures to cellphones, tablets and the cloud mean photos won’t be lost and can be shared immediately. Reviewers have reported significant difficulties with the integrated back-up system, without successful resolution. The Bluetooth does not function as stated, which means backing up the photos and sharing them are impossible to achieve. Since that is Nikon’s major selling point for this camera, it is a major issue. A few users stated the settings and controls were difficult to interpret or have function as instructions seemed to indicate. 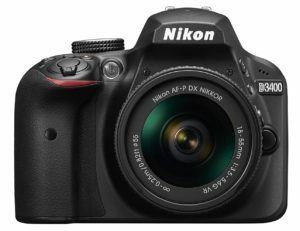 Some complain about the quality of the interchangeable Nikon lenses, resulting in loss of image sharpness, and less than adequate flash reach in low light conditions. Features available on less advanced cameras, like tilting and/or touch LCD screen, are missing. Going back to basics brings to us a 35mm film camera so easy to use, it allows your child to concentrate on what it means to take a photo. Film speed is set when loaded, and beyond that, the only shooting controls are photography fundamentals, namely aperture, shutter speed and focus. Everything is manual, meaning your child will learn the how and why of photography. Since this SLR camera does not need a battery to run, it is always on and ready for the next image. Many photographers, even professionals, include it in their gear bag, even if they regularly shoot digital, because of the unique characteristics this vintage equipment can produce. This camera comes highly recommended by instructors and is required equipment in many photography classrooms. Many people state this is a beginner’s or amateur’s camera, as if taking their time to frame, focus and shoot is a wasted effort. If your child is low on patience and not interested in a learning curve, this will not be the camera for them. Reviewers note this isn’t the camera for people ready to fall in love with gear; it’s meant to help them fall in love with photography. 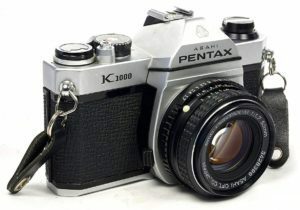 Keep in mind that this vintage camera is only available through third-party sellers. There are no guarantees on quality or damage; buying it from a reputable camera store is recommended. Reviewers advise users should shoot a roll and have it developed to ensure the camera is functioning properly.